Tech firms are now some of the biggest on the planet. Apple became the world’s first trillion-dollar company in August, while Amazon, Alphabet (the parent company of Google), Microsoft and Facebook make up the rest of the top five companies on the planet by market value. And each of these companies, along with numerous other, smaller tech firms, have changed the world in different ways. Without Google, you likely wouldn’t have found this article (the same could be said for Facebook) while Amazon has revolutionized the way we shop. And the chances are you're reading this article on a Google- or Apple-made, or Microsoft OS toting, device. The size and reach of these companies inevitably means that the products they make, and the ways in which they behave, have significant environmental and societal effects on the public at large. Whether it’s the use of raw materials to create the next iPhone or Google Pixel device, or Facebook changing the way we interact with each other on a daily basis, these companies have changed the lives of billions of people in many ways. So who is keeping the biggest businesses in tech in check? It’s a daunting task, but one way of doing it is through an initiative called 'responsible research and innovation'. You may have heard the team before – it's a big buzz phrase in tech circles at the moment – but it has a broad definition, and it's employed to tackle a variety of different issues relating to the ways companies effect our daily lives. That’s pretty difficult to break down into plain English, but elsewhere the European Commission has defined the term as covering six key areas that it believes need to be tackled by industries, governing bodies and companies. Engagement: Making sure everyone who should be involved in the discussion, such as society as a whole, other researchers and policy makers have knowledge of innovation. Gender equality: Ensuring equality in gender across all aspects of research and innovation. Science Education: Making sure future researchers have knowledge and tools to engage with the same process. Open Access: Making sure the research and innovation process is both transparent and accessible, usually through the internet. Ethics: To ensure all research and innovation reaches the highest ethical standards to ensure it has high societal relevance. Governance: How responsibility should ultimately lie at policymakers to ensure there aren’t harmful or unethical effects to innovation. But why exactly is it important for the big tech companies to embrace these principles and work toward responsible research and innovation? There's no getting away from the fact most companies primarily exist to make money rather than act ethically. TechRadar spoke to a source the European Commission who told us: “Business practices should also be aligned with the values, needs, and expectations of society. Part of this entails adhering to high levels of ethics, and applying both the letter and the spirit of EU laws. “We have seen recent examples where big tech companies have failed to adhere to the spirit and potentially also to the letter of the law regarding data protection, privacy, and so on. The source didn’t expand on the previous scandals they were referring to, but it's highly likely that they had in mind the Cambridge Analytica scandal, when that company harvested information from 87 million Facebook users without their consent, and allegedly sold the information on. 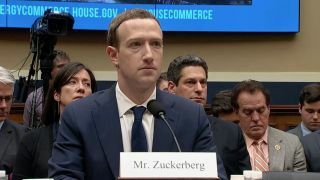 This became a huge embarrassment to Facebook, with founder and CEO Mark Zuckerberg appearing in front of the US Congress to apologize publicly, and the company undertaking a costly advertising campaign in an attempt to reestablish its reputation. Could more responsibility in its innovation have helped avoid the issue? We’ll likely never know for certain. Aside from the reassuring public statements and a few cosmetic changes to their services, it can difficult to know exactly what companies are doing to tackle ethical issues behind the scenes, but we can be sure that Facebook in particular is working hard to make sure nothing like this can happen again. Anthonie Meijers, scientific director of 4TU.Ethics, told us: “Facebook stood out as a bad example for the way they have given third parties access to their users' data and ignored the spread of fake news on their platform, but under pressure they currently seem to be changing their ways. Responsible research and innovation may be an end goal for some of these companies, but the truth is the process won't ever end. It’s something companies will have to continually tackle. Ralf Lindner, a senior researcher on the topic of RRI, said: “I see responsible innovation more as an ongoing process. Just like sustainability, which was absent from corporate agendas until the recent past, responsible innovation will have to be gradually taken up by corporate governance schemes and embedded in industrial R&D practices. No doubt, this will be at times challenging and hard work. Responsible research and innovation is a nebulous and complex topic that many companies still need to get to grips with. Much like innovation itself, RRI won't ever end and it's an idea that will continue to evolve and adapt, just like the big tech firms that need to embrace it.